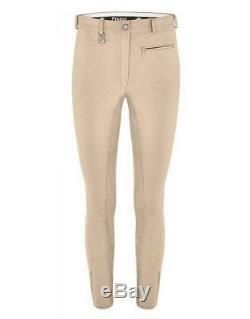 Pikeur Lugana Full Seat Breeches ladies, beige, size 40 (UK 12). The Pikeur Ladies Lugana Breeches have a convenient and practical front zipped pocket. The fabric Lugana Breeches are made from offers excellent climate control and freedom of movement. Additionally the fabric has a very high wear threshold. The Lugana is a slim and very shapely fit. Made with 65% cotton, 28% polyamide, 7% elastane. The item "Pikeur Lugana Full Seat Breeches ladies beige size 40 UK 12 26" is in sale since Friday, November 23, 2018. This item is in the category "Sporting Goods\Equestrian\Clothing & Accessories\Women's Clothing\Jodhpurs & Breeches". The seller is "highendequestrian1" and is located in Crewe. This item can be shipped worldwide.